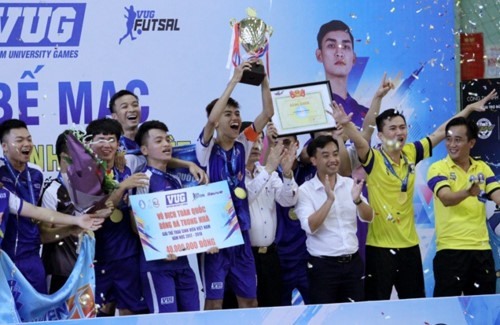 HÀ NỘI — Văn Hiến University won in the futsal category of the Việt Nam University Games (VUG) finals in Hà Nội on May 6. The team defeated rookie CầnThơ University 2-1 in the penalty shootout after a 2-2 draw in the official time. FPT University took the third place. Eight best teams from six regions in the country, who competed in the qualifying round for more than two months, participated in the final round. The event, which was first launched in 2013, drew thousands of students in Hà Nội to cheer for their teams at the Hà Nội University of Science and Technology’s Gymnasium.